The CNT-85R from Pendulum is the most accurate portable frequency calibrator on the market. It offers all the functionality of the CNT-85, plus the stability and accuracy of a built-in Rubidium atomic reference. 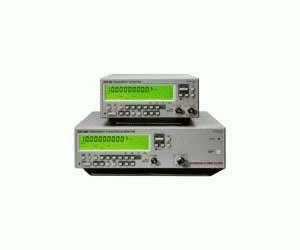 This instrument is ideal for high-accuracy frequency calibration, inside as well as outside the cal lab environment, such as in digital communication systems. The short warm-up time means that the CNT-85R is instantly ready for use after a change of location.